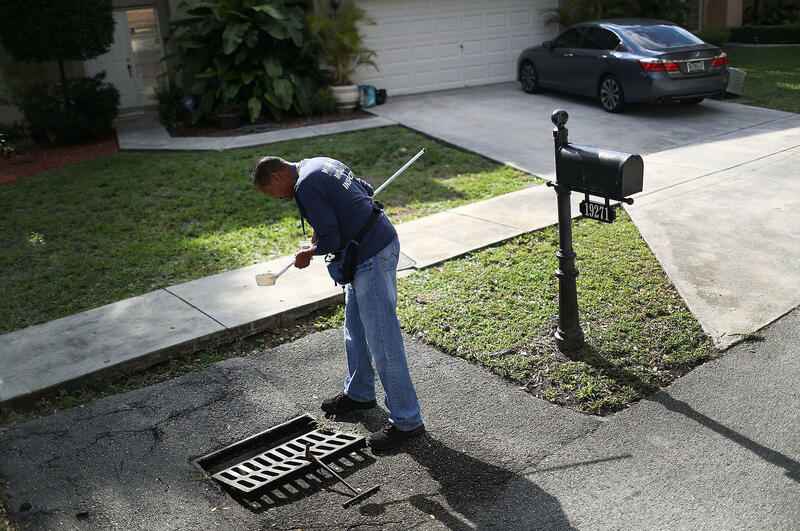 A mosquito control inspector in Miami-Dade County, Fla., looks for mosquito larvae in water from a storm drain. If only, public health experts sigh. If only there were such a fund for health threats, officials wouldn't have to choose between fighting Zika or Ebola. They wouldn't have to run to Congress begging for money and then wait, they say. The public agrees with them. A survey by the Annenberg Public Policy Center shows that 63 percent of people said they support having a fund that the president can draw on to deal with an epidemic without having to ask Congress. Well, it turns out there's been just such a fund all along — the public health emergency fund. Problem is, there's no money in it. The fund was created by Congress in 1983, with an initial appropriation of $30 million. The law says if the secretary of Health and Human Services declares a health emergency and draws from the fund, Congress is authorized to bring it back up to $30 million each year. Problem is, after the first year, Congress only put money back into the emergency piggy bank twice, in 1987 and again in 1993 in response to the outbreak of hantavirus in the West. The fund was reauthorized by Congress in 1990 with the balance raised to $45 million, according to a report by the Congressional Research Service, but it since has been abandoned. 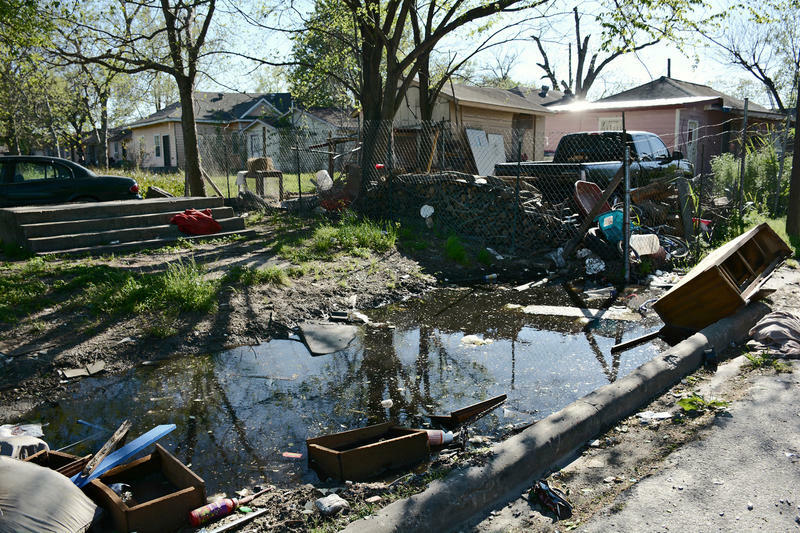 Today the fund has $57,000 in it, according to a spokesman for the Department of Health and Human Services. Today a $30 million pot of money wouldn't go very far. President Obama requested $1.9 billion from Congress to try to combat Zika last February. Four months later, Congress is still debating how much money to allocate and where to get it. The Senate has approved a bill giving the administration $1.1 billion in newly allocated money to mount a Zika response — which includes efforts to control the mosquitoes that carry the disease, research to find a vaccine, develop faster, more accurate tests for Zika infection and ways to deal with the birth defects that the virus can cause. Scientists agree that the virus can cause microcephaly — a condition where a baby's head and brain are undersized and underdeveloped — in about 13 percent of babies born to women who get infected while pregnant. It is also linked to several other types of birth defects, and to Guillain-Barre syndrome in adults. The House, by contrast, agreed to take $622 million, most of which had been dedicated to fight Ebola, and use it to combat Zika. Obama says he'll veto the House bill if it reaches his desk. To avoid these fights in the future, Rep. Rosa DeLauro, a Connecticut Democrat, has proposed legislation to re-up the public health emergency fund, by injecting $5 billion to be used for future emergencies. That's about what lawmakers set aside in 2014 to fight the Ebola outbreak in West Africa. And last week, Dr. Tom Frieden, the director of the Centers for Disease Control and Prevention, called for a permanent fund in a speech at the National Press Club. "In a public health emergency, speed is critical," he said. "A day, a week, a month can make all of the difference." He called the emergence of Zika "urgent and unusual" and said he was initially stunned when lawmakers told him if they move fast, money would be available after three months. So far, there have been no reported cases of mosquito-borne Zika virus transmission in any of the 50 states. But scientists predict that will change this summer, with outbreaks expected mainly in Florida and the Gulf Coast, but with the potential to spread as far north as southern Minnesota and Maine. On the Health Affairs Blog, Georgetown University health law scholars Alexandra Phelan and Lawrence O. Gostin argue that Congress should approve the $1.86 billion emergency funding request President Obama submitted in February to combat Zika virus at home and abroad. 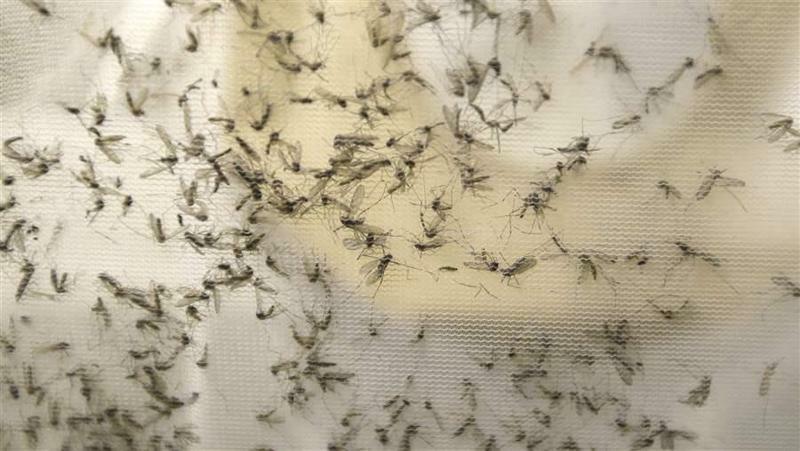 State health officials were heartened when President Barack Obama asked Congress for $1.8 billion to combat the spread of the Zika virus last month, because they fear they don’t have the resources to fight the potentially debilitating disease on their own. On March 10, Rep. Sheila Jackson Lee held a news conference at the Good Neighbor Healthcare Center in the part of Houston she represents. The mayor and a bevy of other state and local officials stood behind her.